Hey guys, today I’m coming at you with The Blue Cat Blue Sea award. I was tagged to do this by my blogger friend Rebecca @ Mylifeasasportsfangirl. I’ve never seen this tag done before, but nevertheless, I am honoured to have been tagged so thank you, Rebecca!! WHAT IS YOUR FAVOURITE READ SO FAR IN 2018? WHAT KIND OF UNJUST QUESTION IS THIS REBECCA LET’S BE REAL YOU ALREADY KNOW MY ANSWER. No question, Hunting Prince Dracula takes the cake. 2018 is cancelled because the only thing that will top this is book 3. This was the cherry on top of the 2018 cake and September needs to come immediately. Aside from my Goodreads challenge (52 books) this year I will also be participating in the Beat the Backlist Challenge. WHO IS AN AUTHOR YOU’D BE HAPPY TO LEAVE BACK IN 2017? I didn’t really read too many terrible books last year but there are definitely some authors I just don’t care about so I think I will go with Rainbow Rowell. I just… so many people love her because of the anxiety rep in Fangirl but also she mocks anxiety on Twitter so what’s her end goal in all this??? Also, I know next to nothing about her other books but doesn’t one involve stalking for “love” and isn’t another one racist?? No thanks. Not my cup of tea. Name one book you haven’t recommended for a while but think everyone should read. What’s your most anticipated release of 2018? Who is your book girlfriend/ boyfriend OR Which book character would you most likely be friends with? HOW IS YOUR 2018 GOING SO FAR? WHAT’S BEEN YOUR FAVOURITE READ SO FAR? Posted on March 7, 2018 March 2, 2018 by EllynPosted in AwardsTagged 2018, award, The Blie Cat Blue Sea Award. I know, I’m so excited to talk to you about it. I can’t wait to hear all your thoughts!! Hearing everything you have to say abt it is just making me more excited for book 3! Ahh tell me all the things!! Will you review it? I keep wanting to read Stalking Jack the Ripper. I only hear good things about that whole series! Oh my God, Angelica you have come to the right blog if you want to be convinced to read the books! I hope you read the book and love it as much as I did and still do! It is one of my favourites, if not my favourite series, you should definitely give it a go! I totally understand your hesitation! Only book 1 focuses on Jack The Ripper if that’s all you’re worried about. I still recommend the series. I don’t know if you’ve read The Name of The Star (also a take on JTR), but it is very different. SJTR is all about feminism, mystery and gore! I hope you decide to pick it up, it’s too good to pass up! Congratulations! And ty for the tag! 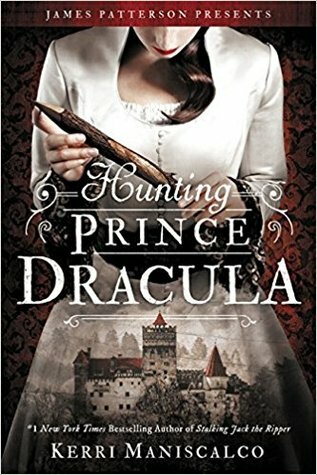 I really want to read Hunting Prince Dracula! I really enjoyed Stalking Jack the Ripper and I think I want to pick up the physical copy for a reread at some point (not the audio like last read). I hadn’t realized that Rowell was questionable on Twitter? I haven’t read Fangirl, but recently read Carry On and read Eleanor & Park ages ago. While I enjoyed both, there has been a lot of talk about the racist dialogue in E&P which looking back I understand. I might have to check out the author more before I decide to keep following her books. Thank you, I hope you do the tag – I can’t wait to see your answers! You totally should. Somehow (in my opinion), Hunting Prince Dracula is actually better than Stalking Jack The Ripper! You should definitely re-read it, maybe sometime around the release of book 3?? Yeah, she has been. She made some joke about anxiety (I think it was about how young people don’t like talking on the phone) and it wasn’t received well. Basically, I don’t understand how someone can write a book abt an mc with anxiety that has been talked about so positively in the community, and then disrespect and mock than mental illness widely on Twitter and think it’s okay. This book has literally helped so many people to come to terms with their own anxiety or to understand the mental illness and here’s the author mocking it and throwing it in their faces. It’s not acceptable, it’s hard enough to live with anxiety without people mocking you for feeling uncomfortable about taking a phone call. And yeah, from what I’ve head there’s racist dialogue in Eleanor and Park & one of her adult books, Landline, is about a creep who reads people private emails (admittedly, that is his job) and then gets obsessed with them, stalks them and falls in lust with them. It’s just disrespectful behaviour all around and I don’t understand how sensitivity readers and publishers never caught onto any of this in her books and why she hasn’t been talked to about her behaviour on social media. Honestly, Rainbow Rowell can stay in 2017 because I am done with her. I appreciate the rant! It’s always good to know what the author is like behind the book. That’s super disappointing to hear. The anxiety rep was something I had TBRd Fangirl for, because I’ve been diagnosed with GAD myself. Do you know if she responded to the backlash at all? I can see how Landline could make for an interesting book if handled correctly, but the way Rowell has handled other things it makes me wary. I think I’ll read up on everything a bit more, but in the end there are other anxiety rep books out there by #ownvoices or by authors who are sensitive to the condition. I think RR did respond to it, but it was the customary “Sorry, I didn’t know” response which to me very lacklustre. Exactly, if you’re going to read about minority groups then why not aim to read as much #ownvoices as possible?